OUR PRICE: $8.99 - Join Rewards Get $1 Dance Dollars On This Item! Go Girl is a trusted brand among dancer's for over 20 years. Made with high quality materials for maximum durability and sparkle, Go Girl products are guaranteed to make your ensemble pop! 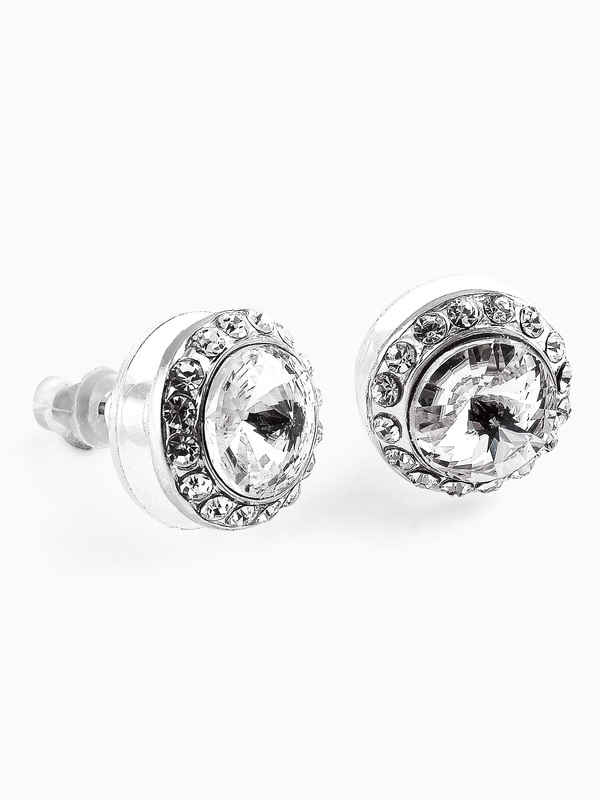 These earrings feature 16 small stones set around a brilliant 8mm center stone, creating a glitzy rhinestone earring that is the perfect addition to any performance outfit! Silver plated, won't tarnish. Hypoallergenic. CLICK HERE to see the full color collection. If you have sensitive ears, these will make your lobes itch. I think that trumps over how sparkly they are. my dance team bought these for performances auditions and competitions they were great except the back bended in the package and the eventually broke off the stone . I bought a new pair and nothing ever happened to them again just be care not sit on them like my teacher did! Didn't expect these to be so small. I bought them for my teenage daughter and they aren't big enough but there pretty! These earrings look great onstage, but several of my dancers' earrings had stones fall out and the post would snap off. Also, the back part is too loose so several dancers completely lost earrings because they fell out of their ears! I also had many dancers who had to buy the clip on style instead because these infected their ears. I love these ear rings! They are really really pretty and elegant. The white ones work best for stage(because of the design of them) but I have them in purple and I love wearing them to class, or even just out to dinner. I bought this item because everybody at my studio has them for competitions. They were smaller than the ones my studio uses, but they are still pretty, and I'll use them out of dance instead! Very pretty earrings, although they are kind of small. These earrings are so shiny and pretty we all wear them at my studio. We use them as company earrings and they're great. I have had mine for a while and they still look just like when I got them. Great purchase!